Since 2007, we've expanded techPresident's staff and daily work to exhaustively look at how technology is changing politics, government and civic life. To provide the independent and deeply informed journalism we do, we need to find ways to support this growth that will allow us to keep the majority of our content free. To subscribe to Personal Democracy Plus, visit personaldemocracy.com/subscribe. To make a contribution in the amount of your choosing, visit personaldemocracy.com/contribute. Can an Obama-like Campaign Work in France? According to a recent TNS Sofres survey, 39% of French people say the Internet will play an important role in the electoral campaign. But do presidential candidates agree? The main opponent to President Sarkozy, the Socialist François Hollande, seems to consider the web as an important battlefield, with his 2 million budget online campaign (10% of the total) and 35 people as digital staff. 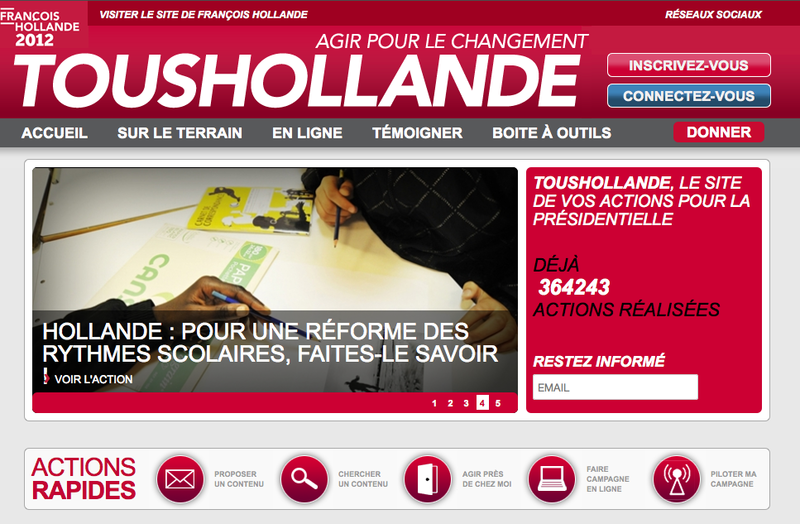 Hollande’s online campaign started two months ago, after his win in the two-round Socialist primary elections, held last October. TousHollande.fr is not a new website, it’s the updated version of another support page created during the Socialist primary. At the time, the website aggregated blogs and tweets of supporters, but it was less known and way less structured. Today FrancoisHollande.fr is devoted to the declaration of the candidate, not to create confusion with the message. TousHollande.fr is aimed at activists in a broaders sense, not only to members of the Socialist Party. Now the campaign website is a fully operational and dynamic site that lists all the contents produced by the campaign and some from the candidate’s website. available. Volunteers can create their own account (“Mon compte” in French). On the left column the list of the most active volunteers is also displayed. Sounds familiar? The resemblance with My.BarackObama.com is not just part of the lessons that every political campaign is trying to apply since 2008. A turning point in the campaign happened in fact last February when Blue State Digital started consulting for the campaign, bringing their expertise to mobilize supporters and votes that proved successful in the Obama campaign. The Hollande campaign is learning a lot, especially on voter segmentation: “We followed the advice of Obama’s Blue State Digital, to adapt the communication to voters, creating customized messages for them”, declared Vincent Feltesse, Hollande’s online campaign manager, to L’Express. Seven different categories have been created based on the visits to the website, the magazine reports. Another crucial tool so far is the use of email. As noted by Le Monde, there’s a peculiar problem in France: email databases can be built only with the explicit consent of the users and it is against the law to buy and cross email lists and databases. Here, the primary election gave a competitive advantage to the Socialist Party and their candidate: they could start their engagement campaign with a list of 650,000 supporters that willingly gave their address when they voted in October (in two rounds). Feltesse declared that the number has grown a lot, but refused to give updated numbers. 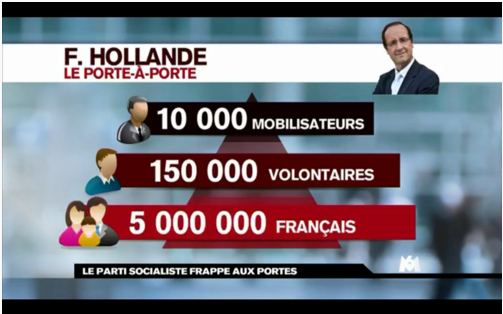 But if the Hollande campaign is just channeling Obama 2008 (and 2012), is it working? “The news in this campaign is that the web became a tool to mobilize people. We are on every social networks [...] but this year, the web is a successful way also to fundraise and canvass door to door.” recently said Feltesse in an interview to the French news site 20minutes. In the footsteps of the Obama campaign, Hollande staff has launched the “5 millions knocked doors,” a canvass initiative particularly focused in areas that register a high rate of abstensionism (in France citizens do not need to register to be able to vote). The activity was not new in France but this year the Socialist Party could refine it thanks to three French grad students who created an improved mapping of the country using their knowledge of statistics and economics. supporter willing to join the initiative just needs to provide his ZIP code to be contacted and be part of a local group, explains Slate.fr. The structure is pyramid-shaped, starting with 150 people from the staff that will train 10,000 supporters: these 10,000 will have to mobilize 150,000 volunteers. them even volunteered for the Obama campaign in Boston. But there is also another area where a savvy use of social media may prove game-changing for the first time. In 2008 the Obama campaign showed how the web could be used for small-donor fundraising (and the Dean campaign had indicated the path in 2004), but in Europe the situation have always been different: campaigns are usually financed mostly by parties and, in many cases, parties have lots of financial support by the government. And the email list built in the primaries is proving useful in this area as well, with significants results registered in these past weeks: “Every week, we call on our supporters through our newsletter and we mobilize between 50,000 and 80,000 euros, for different projects.” Vincente Feltesse said on the matter. But where is the candidate when it comes to Internet policies? For some time, in France the discussion around technology and politics has been mostly focused on Hadopi, the 2009 copyright law that introduced the “graduated response”, also known as “three-strikes law”, that can end up in the suspension of Internet access for copyright infringers. The law is usually indicated as a bad practice in this field, but this is not an easy take for Sarkozy’s opponent, as he has to balance his stance against the law with the protests of artists. He attempted to do so in an op-ed published on Le Monde, where he said that a new economic model has to be created and will have to combine different solutions. A detailed proposal has been awaited but it is yet to be seen. “We will replace Hadopi by another law, which will build a better equilibrium between civil rights and the defense of intellectual property. For this purpose, we are engaged in a large consultation of all stakeholders so as to reach a fair solution for the benefit of all parties.” wrote me Fleur Pellerin, Hollande’s digital policy advisor in an email interview. Even if the economy is a crucial topic, at the moment it does not seem likely that the digital economy will be as much discussed as Pellerin wishes, as the topic was not broadly explored in the public debate, except during the protests against ACTA (opposed by Hollande), the international agreement that sparkled a Europe-wide debate. politics in France that we see in the US? In France, it is not the first time that relevant political conversation happens online. The country has a relatively old political blogosphere that played an active role in the 2007 campaign, but social networks may well be considered the biggest news in the media scenario since then. France, though, has been slower in the adoption and use of social networks, compared to other countries. Facebook, for instance, is the most used social network, with 15 million users (France’s population is about 61 millions), while Italy, that has roughly the same population as France, counts 27 million on Facebook. Even though Twitter founder Jack Dorsey was greeted by both candidates last week, his creation was little used until last summer, in coincidence with the arrest in New York of Dominique Strauss Kahn, former head of the International Monetary Fund, and a French presidential hopeful until that moment. According to a word analysis created by Owni.fr on the bios of the candidates’ followers the two recurring words are “politics” and “journalist”, which seems to support the impression that the tool has mostly been used by people professionally involved in the campaign, so far. In a web campaign guide published by "RSLN", Microsoft France’s webzine, it is said that almost 80% of French voters are now connected to the Internet, with a 20% estimated growth compared to five years ago, when the last presidential election took place. Next April 22nd, the first round of elections will show a partial outcome of the Socialist candidate’s online campaign and will answer a question that communication and politics professional are asking themselves: is it time for an Internet campaign in France?